I’ve decided to occasionally feature one of my best Esperanto shirt designs. ‘Best’ means that I like it. 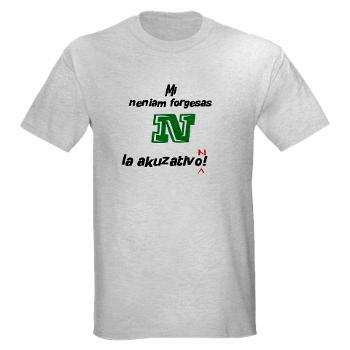 In English this shirt’s meaning would be ‘I never forget the accusative.’ It refers to a common error made by unpracticed speakers of Esperanto. The shirt sports a large ‘N’ because that letter marks the accusative in the language. It also features a missing ‘N’ along with the needed correction on the last word of the shirt. I meant it as a numerous poke at ourselves. If you wanted to purchase this shirt, it’s available via CafePress here. 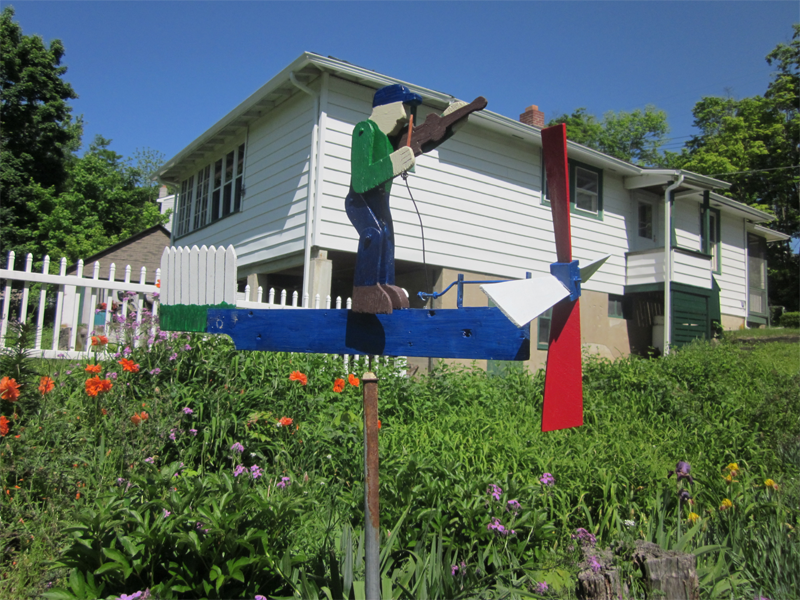 Back about the time that we moved into this house, I got the idea that I wanted to build a whirligig of a fiddler. At the time I had been taking violin lessons and the idea of a fiddle playing whirligig appealed to me. This is before I had any real tools for doing such projects and the extent of the idea never went beyond a drawing on a piece of notebook paper. That piece of paper was tacked to our kitchen bulletin board right up until it was relegated to the attic. The idea stayed in my head though until recently I started looking up whirligig how to’s in our local library via the internet. What I found was a book by Anders Lunde which described what tools to use, what materials to use, and basically how to build simple, mechanical, silhouette whirligigs. I thought the book so helpful that I bought a copy via Amazon. The book was most helpful in describing how to make the propellers and the base for these wind toys. Going against common sense, instead of building one of Mr. Lunde’s designs, I dove in and designed my own. I actually found what became my basic design during a picture search for ‘fiddler whirligig’. I traced it into autocad and made a few adjustments. I created a cardboard pattern to be sure the joints would work properly and transferred these to wood. The wood for my whirligig is completely recycled from stuff I had around the house. The only things I had to buy was a small tap & die set and some brass rod, nuts, bolts and washers. All I can say is that the dang thing works. It’s cool to see it set into motion by a light breeze. I have three more in progress as I speak, but I’ll leave them to their time. 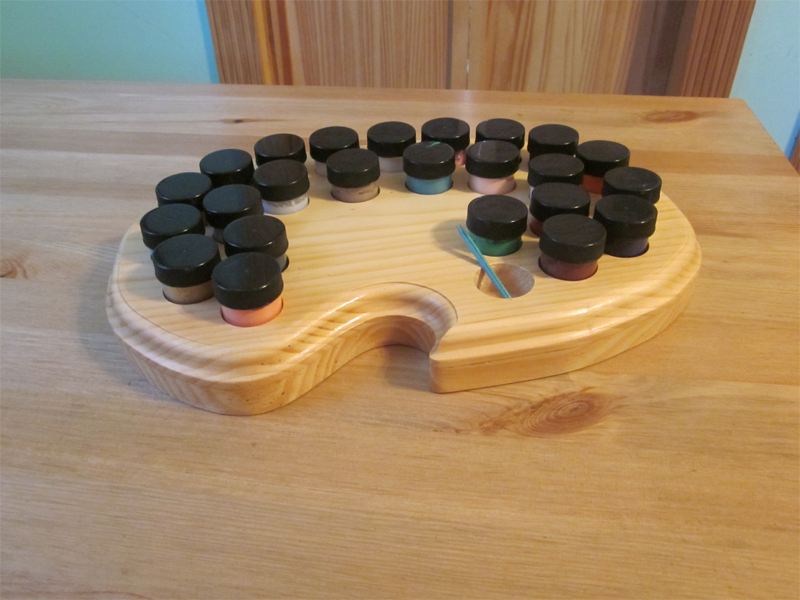 I’ve decided to start posting some of my woodworking endeavors to document my projects and progress in the hobby. First up is one I made last year for my daughter. Her poster paint pots tended to topple over when she would feel like painting. I thought what would be more appropriate than a paint pot holder shaped like an artist’s palette. I took two odd pieces of wood that I had which were actually warped. I glued and clamped them face to face, concave sides facing each other. The glue up straightened out both boards and the grains matched up to appear almost book-matched. I drew out a palette shaped line and cut it with my electric handheld jig saw. Then I had to buy a forstner bit the correct size for the paint pots because the set I bought didn’t include that in-between size. Lastly I had to buy a Roman Ogee bit for my router. (did I mention I’m more or less just getting started in this endeavor?) I sanded the piece and finished it with spray acrilic satin spray. It measures about 10×14 inches and holds 24 paint pots with an extra well for stirring sticks. Ŝiptaglibro de la Kopluŝa Kosmoŝipo Itsen: la 5an tagon de la 7a monato de la jaro 1082 de la Kopluŝa Erao. Pasis du semajnoj ekde Leŭtenanto Eru Tejrk transiĝis kaj eniĝis la alimondŝipon. Ni ankoraŭ ne ricevis kontakton de li. La kosmofaldaj kampogeneratoroj de nia ŝipo estas nun riparitaj, sed pasos du aŭ tri semajnoj antaŭ ol la mapo de hiperkosmo sufiĉe finiĝos por ke ni povos fari hipersalton. Tri el niaj ŝipanoj inkluzive Komandoro Iloŭ, Observistino Barinium, kaj Med-Teknikistino Trejd restas forlasitaj sur la planedo. Ni ne scias kiel reagus la alimondaj se ni lanĉus savmision. Unu el niaj surteriĝŝipoj detruiĝis provante reiri al la planedo. Mi esperas ke Leŭtenanto Tejrk agas saĝe. Kapitano Karpla sidadis rigardante la ekranon kiu montris la tri alimondajn ŝipojn. Li scivolis pri kio okazos kaj deziris ke estus unu pruva ago li povus fari. Ĉiu pasiganta minuto rememorigis lin ke neniu ŝipo revenis el sektoro 42. Lia vizaĝo aspektis timema. “Ho Zoŭg! Ili celigas! Iru!” La ekrano senbildiĝis je tiu punkto, kaj eksplodo skuis la Itsen. Plua eksplodo frapis la ŝipon. “Tio estis kampogeneratoro ĉe la triborda flanko. Unu plu kaj ni devos piediri hejmen,” diris Leslej. “Veturigu nin nun!” kriis Karpla. Plua eksplodo frapis, kvazaŭ helpi la foriron. La lumiloj en la komandejo ekflagris. “Ni iras, damne! Lasu nin iru!” Plua eksplodo skuis la ŝipon, sed ĉi tiu iom malpli severe. El la taglibro de Ŝengek Barinium, Observistino por la Kopluŝa Konsilantaro. 1082, 7, 20. Ni jam estis sur ĉi tiu infernaĵa planedo dum monato. Ni ne ricevis kontakton de la Itsen. Eĉ Mogbi diras ke la afero ne bone aspektas. Li kredas ke li vidis kelkajn etajn ekbrilojn en la ĉielo antaŭ 15 tagoj. Mi malamas ĉi tiun lokon ĉar mi devas resti ĉi tie. Ofte, ŝi kaj Mogbi trovis lokon fore de la vilaĝo kie ili povis babiladi propralingve sen la scivolemaj idiĝenoj. Kunaj konversacioj estis la nura restanta parto de iliaj antaŭaj vivoj. Ne plu estis ŝi Observisto por la Kopluŝa Konsilantaro kaj ne plu estis Mogbi Komandoro sur la Itsen. Ŝengek ekscivolis kiom longe daŭros siajn vestojn. Ĉu ili ambaŭ finos vestite en feloj kiel la indiĝenoj? Ŝi sentis la mankon de sia patro, sed almenaŭ li estis ĉe Kopluŝo, ne ĉi tie sur primativa planedo. Ŝengek hezitis. “Ĝi estas bela luno. Kopluŝo ne havas eĉ unu, ĉiokaze mi neniam vidus ĝin en la subteranaj urboj post la Katastrofo. Ŝi supren rigardis la lunon nomata Glorin, kaj ree al la tero. “Mi kunmarŝas kun vi. Mi promesis ke mi helpos al la viroj pretiĝi por la ĉaso. Dum la energio daŭros en ĉi tiu,” li tuŝis la magnet-fusilon, “la vilaĝo bone manĝos.” Mogbi stariĝis, ekrigardis la lunon refoje, kaj kuniris kun Ŝengek al la vilaĝo. Ŝiptaglibro de la Kopluŝa Kosmoŝipo Itsen: la 15an tagon de la 8a monato de la jaro 1082 de la Kopluŝa Erao. Ni estas preskaŭ elirinte de sektoro 42 kie ni povos halti kaj ripari niajn kampogeneratoron por la Salto hejmen. Mesaĝo el Kopluŝo diras ke la Alianco metas sektoron 42 sub protekteco, kaj ke neniu kosmoŝipo rajtas eniri la lokon. La Konsilantaro rifuzis mian rekomendon kaj nomis la sesan homoplanedon ‘Karpla’. La stelo estas nomata ‘Karplaŝun’. La alimonduloj kiun ni renkontis estas nomata Erutejrk pro la brava Leŭtenanto. Post la fino de riparado, ĉi tiu ŝipo komencos esplori preter Nidia kosmo. Kiu scias kion ni malkovros tie? You are currently browsing the A Koplushian's Blog blog archives for May, 2012.